Carlo Ancelotti is one of the greatest managers of all time, with five Champions League titles to his name. Yet his approach could not be further from the aggressive theatricals favoured by many of his rivals. 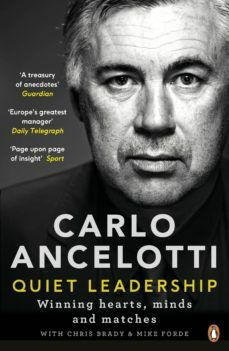 His understated style has earned him the fierce loyalty of players like David Beckham, Zlatan Ibrahimovic and Cristiano Ronaldo.In Quiet Leadership, Ancelotti reveals the full, riveting story of his managerial career - his methods, mentors, mistakes and triumphs - and takes us inside the dressing room to trace the characters, challenges and decisions that have shaped him. The result is both a scintillating memoir and a rare insight into the business of leadership.